The noodles used in Se-Abura Ramen are thick noodles looking like Udon and in the soup having a strong soy sauce taste in which you can lightly feel the flavor of seafood including anchovy. It features an amount of pig back fat large enough to create a fat-slicked surface and keep the steam in the bowl. Many stores are using chopped onions instead of onions as condiment. 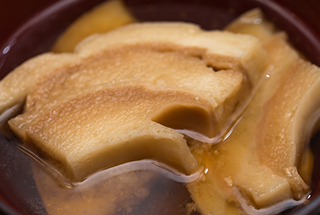 Since ancient times in the industrial area of Tsubame-Sanjo, a large amount of back fat was put on the surface so that even when noodles got delivered to factories they were still just chewy enough and the use of thick noodles prevented it to get cold. 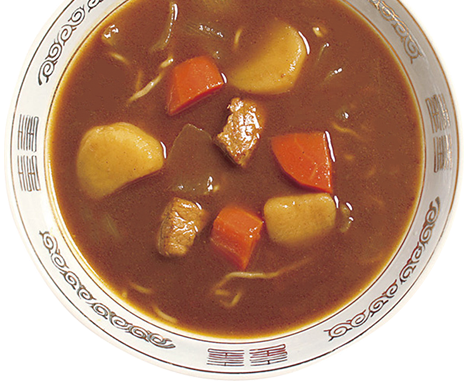 Although it is considered as “second-class gourmet” by the younger generation, Curry Ramen has a long history of more than 70 years. 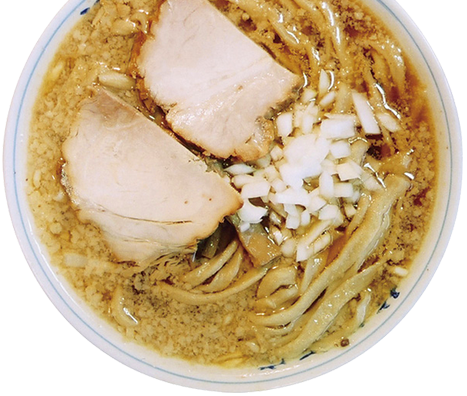 You may think that it is just putting curry on ramen but actually each store has its own curry and also its own soup, offering an infinite variety of tastes and shapes. You can enjoy as many different Curry Ramen as there are shops. 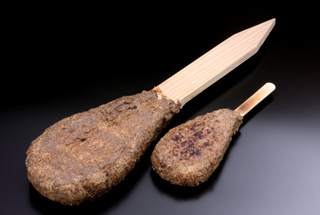 The Hikozen using 100% Koshihikari rice kneaded onto a bamboo skewer and grilled over a charcoal fire is usually savored after smearing perilla flavored miso onto it. The alpha-Linolenic acid contained in perilla has great properties against cancer and Atopic dermatitis. This grilled rice ball style Hikozen is a popular winter local cuisine that was transmitted to the Shitada district of Sanjo City, and everyone can enjoy it safely since not a single additive is added. Sanjo boasts the biggest shares in Japan for wheel shaped wheat gluten. As it is simply gluten taken from wheat it can be easily digested, and wheel shaped wheat gluten is made by wrapping gluten around a pole, baking it and then adding another layer on top of it, bake again and so forth, then cut it into round slices. It can be eaten after being cooked by boiling, etc.